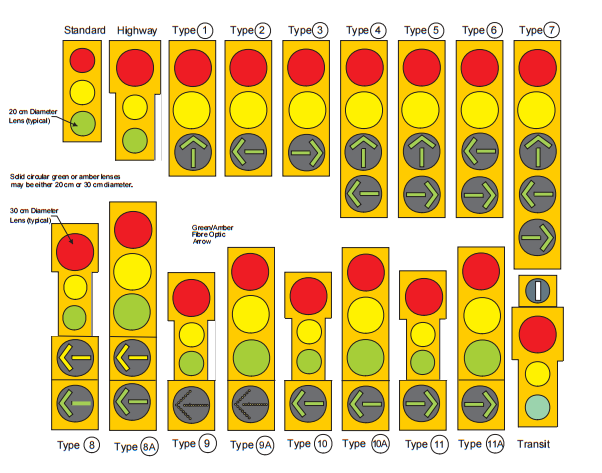 I was looking at the Ontario Traffic Manual Book 12: Traffic Signals and on page 9 (slide 23 of the pdf), there are illustrations of all the traffic signal configurations in Ontario. I'm confused about the first two listed: "Standard" and "Highway"
The "Standard" signal is 20-20-20cm, which I don't think I've ever seen in Ontario. I certainly wouldn't call it standard! The "Highway" signal is 30-20-20. Okay, but what about a regular 30-30-30 signal with no turn arrows? Judging from KW-area signals, I think it would be more correct to call the 30-20-20 signal "Standard", and call the 30-30-30 signal "Highway"
I could be wrong but I'm fairly sure I've seen a 12/12/12 version of the "standard" signal in Toronto's boundaries somewhere. I generally notice this type of stuff but who knows. If a 12/12/12 version of the standard signal exists, is it technically illegal? Maybe the standard was THE standard at one point but it is not anymore. As for "highway", remember that the word "highway" refers to any public maintained road in this province, so who knows. EDIT* I did find such a signal, Islington and The Queensway, I was fairly confident they used 12/12/12 there and they do. No I have not seen a 20/20/20 cm or 8/8/8 inch signal in Ontario to my knowledge. Don't be confused, there are MANY 12/12/12 signals around, but in most of these cases, the green ball is an arrow, indeed any fully protected left turn in Ontario will use a 12/12/12 signal (you know, the ones right next to the LEFT TURN SIGNAL signs), as such a 12/8/8 signal for an arrow is illegal according to this document. The second example you posted appears to be Type 11A assuming that's a right arrow head as that is the right side of the intersection. I hope that's just an old installation. No DOT should be using a 20-20-20 signal, especially on a high speed arterial or highway. I suspect that signal installation dates back to around the time when this was still part of Hwy 11. Sorry, I've updated my second photo as another 12/12/12 signal with only 3 bulbs. 12/12/12 signals without arrows are still quite common in KW. Maybe not in other parts of Ontario? I was reading through this document and I recall 7/8 asking if the Green Arrow that disappears during an advanced green is legal, they say it is only recommended that the yellow arrow be used, this is seen on Page 35 of the document (not the PDF file). Interesting to me, what the FHWA would call a "leading-left", the MTO calls an "advanced green". "When you face a flashing green light or a left-pointing green arrow and a green light, you may turn left, go straight ahead or turn right from the proper lane. 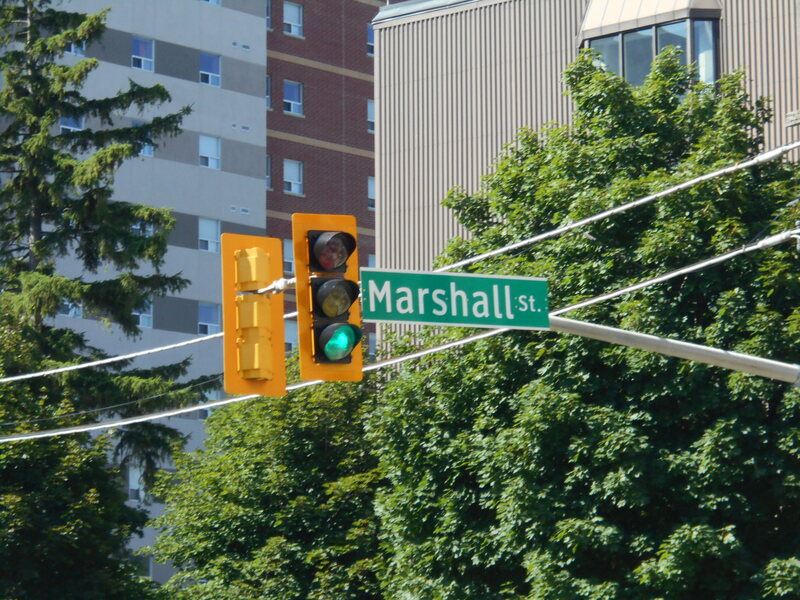 This is called an advanced green light because oncoming traffic still faces a red light." In practicality though, you can only turn right if you yield to pedestrians, the old flashing green balls to my knowledge always had a hand signal showing for pedestrians on both sides, while the green ball/green left arrow shows a walk signal on the side that wishes to make a right turn. Interesting indeed, there goes my theory that the flashing green ball protected the right turn movement as well. But I've always been curious on the history of the flashing green ball signal, I've heard before that the reason they didn't use the "doghouse" signals here (or equivalent like the 4 headed signal we currently use), was because an arrow meant a move the driver must make. Indeed, older handbooks show situations involving simultaneous left turns (when you face a red ball + green arrow) but none showing by the current definition of the advanced green (when you face a green ball + green arrow). Lagging left turns in a permissive-protected situation are known as "extended greens", it makes sense as this is an opposite of the advanced green, indeed I always the "advanced" in advanced green referred to it being a super duper green light (if you get what I mean) but it refers to it being advanced, as before the through traffic signal. Extended Greens can ONLY be used in situations in which opposing traffic CAN'T TURN LEFT. Of course this eliminates the yellow trap, which is illegal to run in Ontario. All this shown on Page 40. Incidentally, they refer to a lagging left in a fully protected situation as "lagging" and not extended....meh, no need to complicate matters do we. Interesting, it's hard to imagine with how common it is now. I'm confused here. I thought split phasing would always require the yellow ball and arrow to be displayed together. Would you mind explaining how this wouldn't be the case? For example, you mentioned the Bovaird Dr/Mountainash Rd intersection in a different thread, which is split phasing. Does this have the yellow ball and arrow together? I don't think I've ever seen an extended green in Ontario. It would have to be used from a two-way street to a one-way street. I personally think the Regina St/Bridgeport Rd and Regina St/Erb St intersections could use these at peak times. Currently, there is an advanced green, but I think both an advanced green and an extended green could be useful at rush hour, since a single vehicle trying to turn left is enough to block everyone behind them. I may need to read through the Book 12 more tomorrow. It definitely looks interesting, and it'd be good to know more of the terminology! 30-20-20 was definitely the most common install in Southern Ontario until relatively recently and still by far the most common in many areas, including the Niagara Peninsula. The flashing green ball was basically the Ontario version of a 4-section with a green left arrow. Of course, the "standard" in Europe is 20-20-20, with some jurisdictions explicitly stating not to use 30-30-30. Hmm, I didn't know that. I guess it's a trade-off; the 30-30-30 lights are very bright, but they have more visibility than the 20-20-20. In most places that use split phasing or separate phasing....since most posters here are familiar with the FHWA jargon, I suggest that we use that terminology preferably. Incidentally, they use an example FROM Toronto here in Section 4.3.5. An extended green or lagging left probably does exist somewhere in Ontario, but it would most likely be found at a T intersection. Since SB Bay can't make a left turn (at least during this time restriction), then there is no issue with running a lagging left (or extended green) on NB Bay as there can't possibly be a yellow trap situation. At the intersection of Yonge and Harbour, if you are turning left onto Yonge, the green arrow signal appears later on in the phase, but this lagging arrow appears moreso as a protection against pedestrians than oncoming traffic. This intersection is strange and I have not observed the phasing here like I have at many other intersections, so I am not 100% sure of what goes on here. But I know as a fact that the green arrow appears long after the green ball has been on. As for a FULLY PROTECTED lagging left, I know they exist at Lake Shore/Windermere, and Lake Shore/Colborne Lodge. What happens here, Lake Shore Blvd gets a green ball for EB and WB, the light for WB Lake Shore changes back to red, and then the EB Lake Shore Blvd LEFT TURN signal displays the green arrow. This is an intersection that clearly shows the positives of the FYA, as this is a single left turning lane, if traffic is clear on opposing Lake Shore, one could make the turn during a flashing yellow arrow, as in the current setup would be a solid red throughout the whole phase until their green arrow appears for the left turn. All new signals to my knowledge are still the 30-20-20 variety normally. The flashing green ball may have been our version of the doghouse but not exactly. The flashing green ball only allows for one type of phase unlike the many others the 4-section does, the flashing green ball can't mimic the "red ball + green left arrow" movement, it's impossible. Of course, with the flashing green ball, you have absolutely NO IDEA when the phase will end, generally as I recall seeing these more common in my real younger days, like early to mid 90s, when the flashing green ball became solid, opposing traffic instantly got a green, there was no clearance phase involved. Sometime in the late 80s, the advanced green defined by the green ball + green arrow appeared in the manual, and seeing as there are some kicking around today, that means it has taken nearly 30 years to make the flashing green ball extinct. I know the FYA is supposed to do the same thing across every state, we might still be seeing doghouses 30 years from now. Certainly in some parts of the country, but I picture most state DOTs switching over pretty soon. Massachusetts plans to get rid of every state-owned doghouse in the next couple years (and they have already started), while New York is doing it by region (with some of those switching using FYAs almost exclusively now). I expect the remaining doghouses in much of the country to live out the rest of their service lives and be replaced, as installing an FYA requires replacing the controller unless the controller is specifically designed for it. Of course, NYSDOT Region 5 might be a bit of a holdover (everything they have plans for through the end of this year is doghouses). Local governments are a different story. Many still install bimodal arrows, even though those are a no-no, while others only have one signal head per approach for new installs. Unless doghouses are specifically banned, we'll keep seeing them for quite some time just because local governments don't give a damn. Oh okay. Next time I'm at King St and Farmers Market Rd north of Waterloo, I'll have to see how they signal the yellow in the split phasing. I can see why the yellow arrow and ball would be a little better than just a yellow ball, but it still seems pretty straightforward. You bring up an interesting point here, and it could easily be implemented with the current signals. Of course, it would require lots of driver education to teach Ontarians what the FYA is. But why not simply use a Type 9 or 10? Then they could use a green bulb for the left-turn lanes too, which would function more-or-less as an FYA. Usually, when I see a Type 2 left-turn signal such as this one, it's for two left turn lanes. And this makes sense to me, since it would be unsafe for two left-turn lanes to try making lefts with on-coming traffic. Do you know why this turn uses a Type 2? I think there are some new 30-30-30's, but I agree most new ones I've seen are 30-20-20. I'll note that at the intersection of Fairway Rd and Lackner Blvd in Kitchener, Fairway Rd had two 30-30-30 3-bulb signals. They recently added left-turn signals, and they're Type 9 (30-20-20-30) instead of Type 9A, which would match the 30-30-30 signal right beside them. This is a good point too. The yellow arrow is certainly helpful! 20-20-20 was in widespread use at one point. Now it has been phased out in favour of Highway (30-20-20) and Oversize Highway (30-30-30). 1. Change the name of "Highway" to "Standard" and then come up with a new name for the handful of old 20-20-20 heads. Then change "Oversize Highway" to "Highway" heads. Then have to go through and spend millions of dollars updating the PH-M-125 drawings for every single signalized intersection in the province. 2. Keep it as is, and while regional and municipal preferences may not choose "Standard" anymore, the terms are universally known and understood. So, guess which one was done? Do you know how far back we're going for 20-20-20 to be standard? This must be quite a few years. But also, how come I don't see the "Oversize" signal in that figure in my first post? That was another thing that confused me since there are plenty of "Oversize" signals that I've seen. Ok, it looks I have made a contradictory statement, but I didn't intend to. Basically, I was suggesting that they shift the yellow line over at this intersection. It appears that Regina has 1.5 lanes in each direction at the intersection. It may be possible at the intersection only, to have NB Regina (at Bridgeport) have 2 lanes, which one would be a left turn lane, and the other would be a through lane. Meanwhile SB Regina would have 1 lane, and this lane would be an option right turn lane/through lane. Obviously a portion of SB Regina before the intersection would have to have a yellow buffer zone as to shift the traffic movement to the right. I just thought about that for a second now as well, and I believe the reason why a "fully protected left turn" is used here rather than the "permissive-protected left turn" has to do with line of sight. I think with the wide median, it may be more difficult to see oncoming traffic, there may be specific situations in Book 12 that shows when you must use a "fully protected left turn" that have to do with line of sight. Similarly, you may be familliar with the Goreway/Queen intersection in Brampton. EB Queen and WB Queen both have ONE SINGLE left turn lane. However, EB Queen has a fully protected left turn, while WB Queen has a permissive-protected left turn. If you look EB along Queen, you can see that line of sight beyond the intersection is not that great as traffic comes blind uphill. I'll let you figure out how this intersection works.....the biggest hint is that the two greens (the ball and arrow) do not come on together EVER. 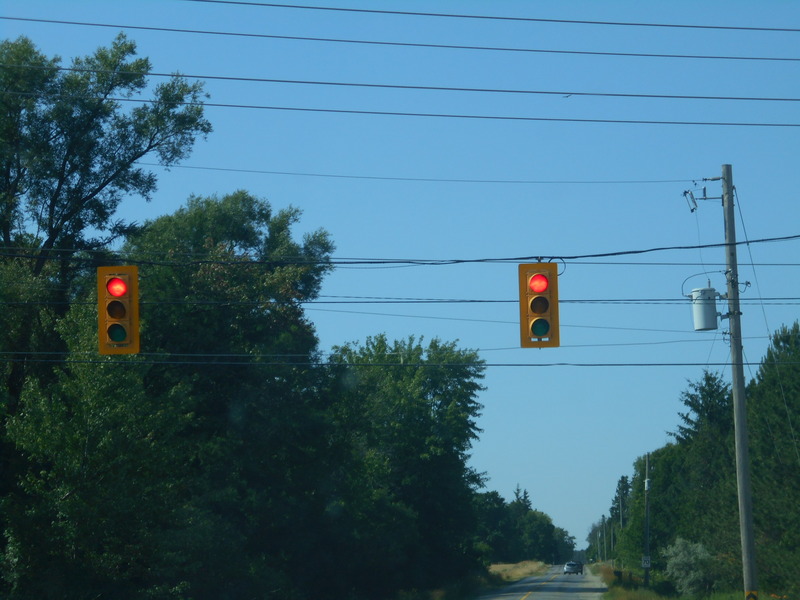 The point I'm making is that this type of traffic light is NOT in the manual. Oh okay, I see. It would be pretty tight though. If it could be done, it would likely be the best solution. It would give less room for cyclists, but they could make that section a "single file" lane for cyclists. Sorry if I'm being dumb, but how is this different from a regular green ball? Judging from GSV, I'm guessing it has to with the constant left-turn restriction and the right-turn restriction at peak hours. For off-hours, it would use the green ball to allow straight and right turns, while peak hours would use the straight arrow to show that no turns are allowed. There are two main advantages to a FYA, I do have a slight issue as you've seen before with the FYA creating an ambiguous solid yellow arrow, you can revisit that thread where I explain it deeply. Bear in mind, a FYA COULD NOT be used at the Colborne Lodge/Lake Shore intersection because due to line of sight issues they have it set as a fully protected left signal. The first advantage is that a FYA makes ALL phases that had yellow trap situations possible to phase safely. Thus it makes it possible to phase extended greens in ANY intersection safely as yellow trap is eliminated. You are exactly right on what the signal at Yonge/Bloor does, they've also introduced at some downtown intersections, large displays that come on when no left turns are allowed at time restricted left turns. I've read up on the yellow trap and I see what you're saying here. If you see a yellow ball, people may assume they have to turn left soon, even though oncoming traffic may still have a green. But a FYA let's you know that oncoming traffic may have a green still. What would be the advantage of using an FYA in this situation over green arrows? Is it to give pedestrians the opportunity to cross? As you can see, a lagging left can be created here. But as this a fully protected left turn signal, traffic won't be allowed to turn left AT ALL until the green arrow appears, which won't happen until the traffic facing SB gets a red (and some time for red clearance to protect left turners against red light runners). Green Ball Yellow Ball YELLOW TRAP!! As we can see, as NB has the extended green, traffic turning left facing SB will get an early yellow while NB still faces a green. Causing what we all know as the yellow trap. A driver stuck in the intersection waiting to make a turn will not know the status of the oncoming through light, and thus it could be a good 15 seconds or more before the oncoming signal gets a yellow. There is also the more obvious issue of drivers not being aware that one side faces an extended green and thus a driver turning left assumes the car coming towards him is stopping when it isn't and this could lead to a jarring collision. When we introduce FYA, we can do this safely, and here is how, the real disadvantage is that SB, although it gets no protected movements in this case will have to get a FYA signal as well. And there we have it. In this case, NB turns can be made through the entire sequence as this is now a PPLT situation. SB traffic turning left WILL NOT get caught in a yellow trap now. Of course you can see the ambiguity I discussed on my other thread at play here, the solid yellow arrow, before all solid yellow arrows were protected, now in this case, SB's solid yellow arrow is actually a non protected yellow. That is the only real issue I have with the FYA signal myself. There is a yellow trap I missed in the first example involving SB traffic. It's getting late now and I'll correct it sometime tomorrow. For the FYA, do drivers have to stay behind the stop line, or can they inch into the intersection like you would for a regular green light? I'm guessing you have to stay back, because otherwise it would appear to be another yellow trap.